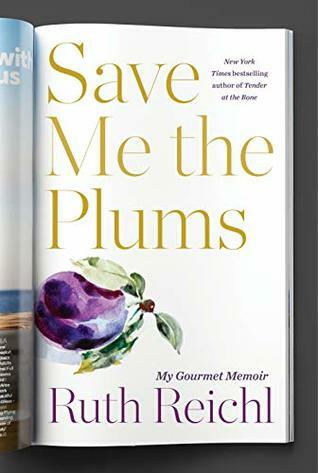 I couldn’t help but marvel, as I read Ruth Reichl’s new book, “Save Me the Plums,” at how she manages to make every one of her books feel so personal and heartfelt. This one, which chronicles her time as the editor at Gourmet is so honest, so raw, that I couldn’t stop until I had taken in the whole story from hiring to [spoiler alert] firing. Every piece of Reichl’s journey through Gourmet is emotional. Her hiring. Her feelings of inadequacy and doubt that humanize her in a way you wouldn’t normally expect from someone who had achieved fame as a food writer decades before she joined Gourmet. September 11th, which launches into her consciousness as she enters the Gourmet offices and sees the second plane crash on television. Her fears and concerns as a New York City resident, as well as her determination to triumph over the fear. Real, palpable emotion that is familiar to anyone who lived through that day. An encounter with an older gentleman in a Paris restaurant. The ambience, the mystique, and that unique “could this really be happening” moment that is standard in Ruth Reichl books. I couldn’t help but cry. A chocolate cake. A stir fry. An apple pancake. An endless cascade of food that never stands on its own. It is always supported by a story and Reichl’s unmatched ability to describe sights, scents and tastes. Can you get emotional about a lobster? Sure you can, with Ruth at the helm. With every book she publishes, you have to wonder if she can continue to produce the magic that is Ruth Reichl’s memoirs. But then she does it. Again and again and again. There are very few people on this earth who I would probably get weird around if I met them in person. Ruth Reichl is one of them. Because, the thing is, she makes you feel like you know her. She lets you into her life on such an intimate level that you can’t help but count her among your friends. Can’t help but admit that if you ever ran into her on the New York City subway, you would just have to ask for a hug. And that is a true gift.